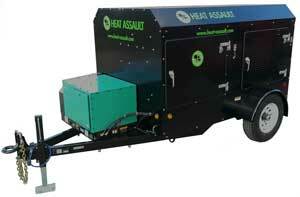 Heat Assault is Green equipment for the control of all life cycle stages of bed bugs and other insects, using HA300 for a single successful heat treatment. The Heat Assault is quick to set up (30 to 45 minutes) and simple and foolproof to operate — no special licensing or training is required to gain control of infestations, anywhere from a small home to a 20-story apartment. Expansion packages, including one for high-floor pumping, are available.